Abbott's nutrition business supports small dairy farmers in India. The result? Win-Win. In the west Indian state of Maharashtra, dairy farming is an important source of income – just as it is for 70 million families in rural India. But it’s unpredictable and challenging work. Although India is the world’s largest milk producer, farmers often don’t have access to the training and resources that would help them maintain and grow their dairy farms. But now that's changing, thanks to a new program from Abbott’s nutrition business. Farmers now have access to technical expertise, as well as much-needed training, resources and infrastructure. As they build their small dairy-farming businesses and communities, this strengthens Abbott’s business, too. It’s a win-win. That’s what shared value is all about. In many dairy farms in Maharashtra, women handle the bulk of activities like animal care, but have limited decision-making power. Like their male counterparts, they also lack business literacy and have limited access to training in farming techniques. As a result, their cows often produce low-quality milk – and not much of it – which in turn leads to low income. Dairy farmers tend to live from one milk collection to the next, rarely able to get ahead or invest in their futures. Abbott is working hand-in-hand with female dairy farmers to help address these gaps. And because women tend to invest more of their earnings than men do in their family’s care, by helping women earn more, both their family businesses and their communities thrive. The idea for this dairy effort started with a business challenge. In 2014, Abbott opened a new plant in India to manufacture nutritional products. However, suppliers weren’t able to produce the amount of high-quality milk that Abbott needed to meet strict quality standards. Working in partnership with India supplier Prabhat Dairy and TechnoServe, a non-profit organization focused on business solutions to poverty, Abbott is reaching up to 1,500 smallholder dairy farmers, providing them with the training and resources needed to increase their incomes, while providing the high-quality milk that Abbott's nutrition business needs. 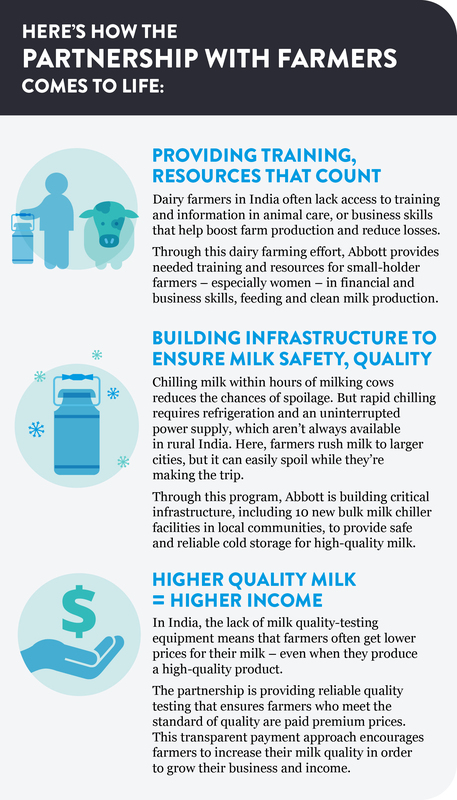 This program is self-sustaining, as it delivers value to customers like Abbott that get higher-quality milk, while helping boost incomes of local Indian farmers. By supporting dairy entrepreneurs, Abbott is able to create a sustainable supply chain for its India nutrition business, while helping family businesses succeed and create opportunities for future generations.